There is a pretty good chance that the number one food being eaten on Valentine’s Day is some sort of pasta. 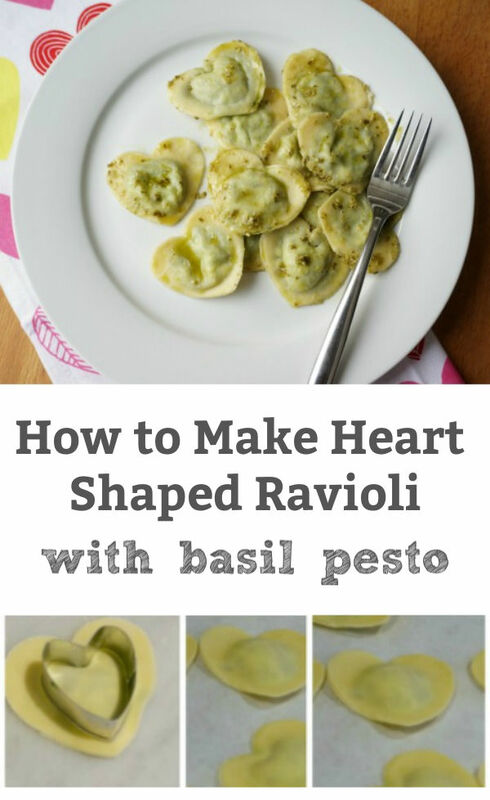 Trust me when I say that this heart shaped ravioli will become a recipe you make year after year. There is something lovely about pasta. Perhaps it is the time and love that goes into making the sauce or perhaps it is comforting and cozy it is to eat. 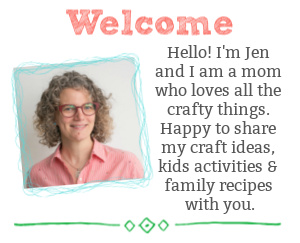 Whatever the reason, one of the easiest ways to show your family that you love them is to make them a delicious meal on Valentine’s day. Around here our family’s favourite homemade dish is pasta. 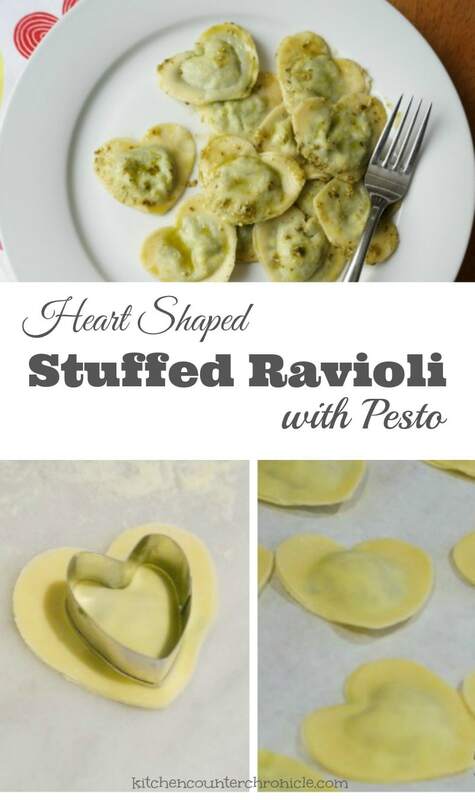 Transform boring old ravioli into Valentine heart shaped ravioli. 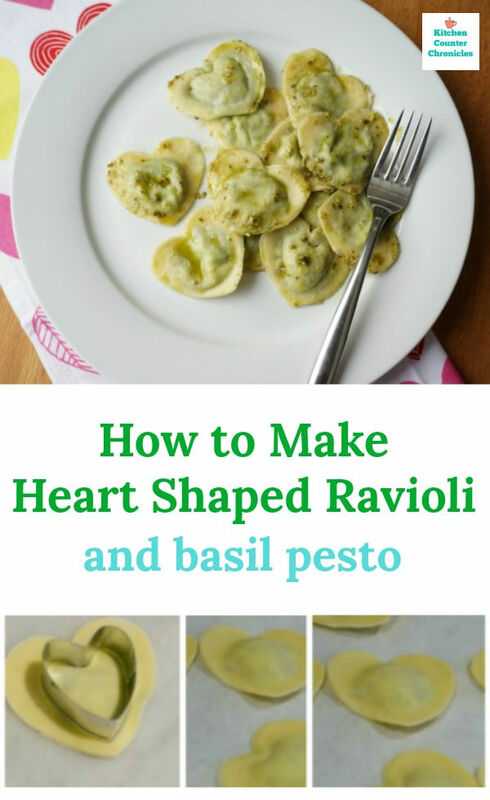 Start with our favourite ravioli recipe and make things a little more lovely with the help of a simple heart shaped cookie cutter. Finely chop spinach in a food processor. Stir together the spinach add the to ricotta cheese, salt and pepper in a medium sized bowl. Set aside to be used in the pasta. 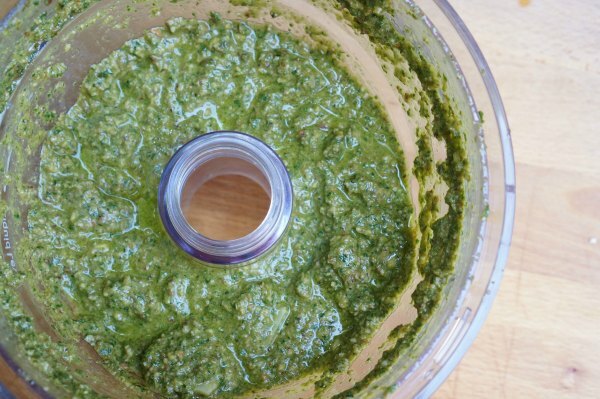 Combine the basil, garlic, cheese and pine nuts in a food processor. Pulse until ingredients are chopped and combined. Pour the olive oil, salt and pepper into the food processor and pulse until the pesto is smooth. Set aside until the pasta is ready to go. 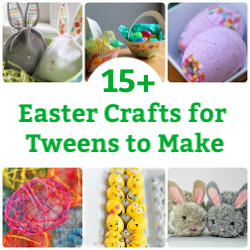 Crack the eggs into the well. Add the oil. Use a fork to beat the eggs and begin pulling flour into the eggs. 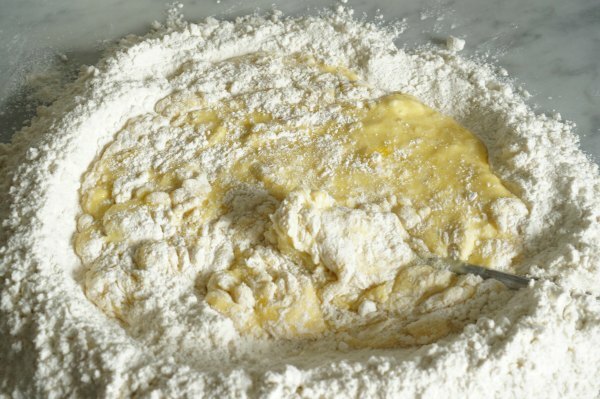 Continue mixing together the flour and eggs. 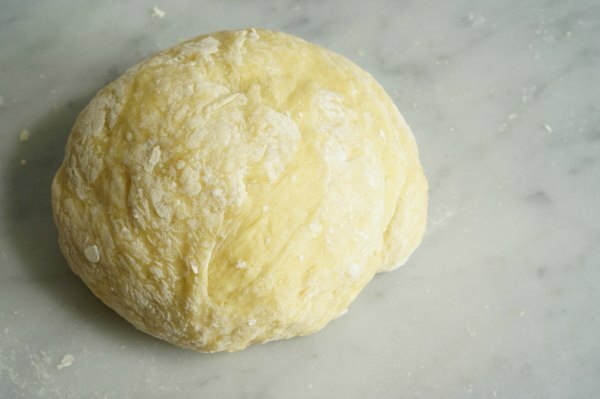 Once the dough comes together, knead until it forms a silky and smooth dough…about 10 minutes. Wrap in plastic wrap and let rest at room temperature for 30 minutes to an hour. Once rested, divide dough in 4 portions and use pasta machine to form sheets of pasta for the ravioli. Feed pasta into machine starting with the smallest number setting (the largest opening size), gradually moving to about a number 6 (smaller opening size)…it should be thin enough to see your hand through the pasta sheets. 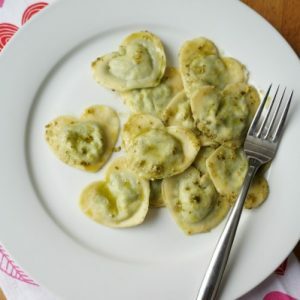 A simple homemade pasta recipe for heart shaped ravioli, stuffed with ricotta and spinach filling. A light and creamy pasta to make and share. Once the dough comes together, knead until it forms a silky and smooth dough...about 10 minutes. Feed pasta into machine starting with the smallest number setting (the largest opening size), gradually moving to about a number 6 (smaller opening size)...it should be thin enough to see your hand through the pasta sheets. 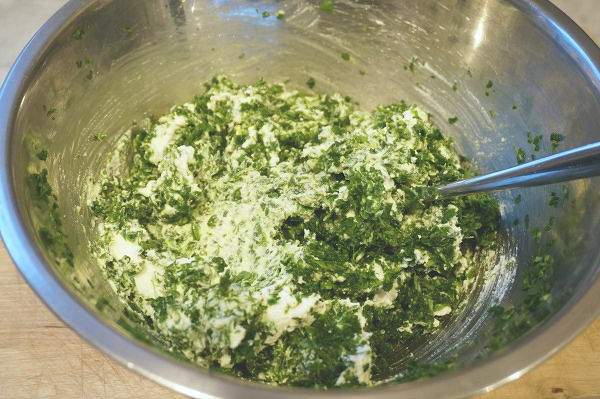 Finely chop spinach in a food processor and add to ricotta cheese, salt and pepper in a medium sized bowl. Set aside to be used in pasta. The pasta recipe is the easy part, the challenging part is making the ravioli. However, after a little practice creating the little pockets of pasta it becomes much easier. Here’s how we make our ravioli. Start with a sheet of pasta, I usually stop at a number 6 thickness (I use the pasta attachment on my KitchenAide stand mixer). 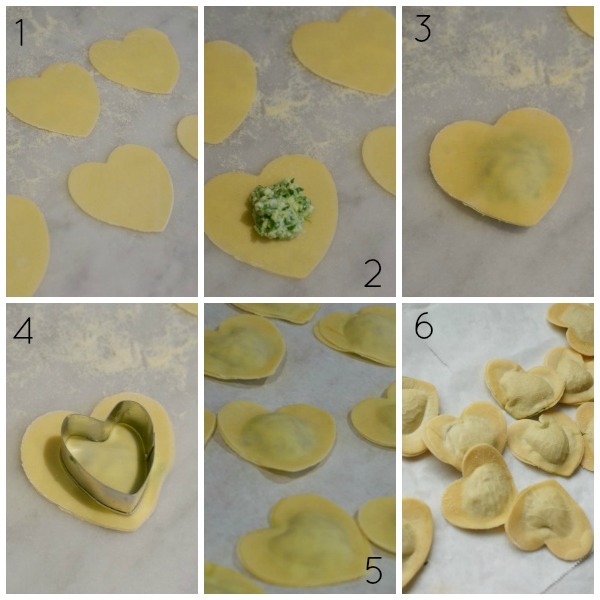 (1) Lay out the sheet of pasta and cut out an even number of hearts…you will need one for the top and one for the bottom of each ravioli. (2) Next, scoop 1/2 tsp of filling in the centre of each heart. (2) Using a pastry brush (or your fingers) paint water around the edge of pasta that has the filling. (3) Place the second heart over the bottom heart and gently (but don’t be afraid of ripping the pasta, it’s strong) press the sides together. Press around the filling, you don’t want any air bubbles around the filling. At this point, I pick up the ravioli and pinch it between my fingers and thumb…completing the seal. 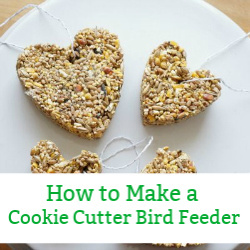 (4) Finally, my daughter used the rounded side of a smaller heart shaped cookie cutter (or a small circle cookie cutter) to gently press around the filling…further sealing the filling inside the pasta and completing the heart shape. (5) Now the pasta can be set aside to dry, frozen or boiled and eaten right away. 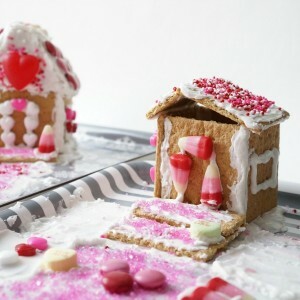 (6) To dry or freeze, place in a single layer on a piece of parchment paper and place in a freezer or a cool dry spot. Be careful with the filled pasta…you don’t want to leave it out of refrigeration too long or the cheese will turn bad. To sauce the pasta, toss the warm pasta with in the pesto. This pasta would taste great with a light butter and garlic sauce too. Don’t forget a sprinkle of freshly grated parm cheese. 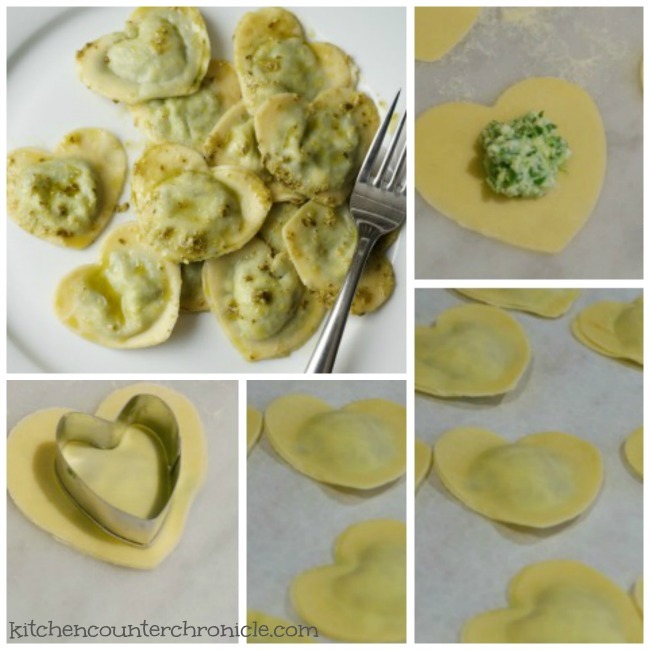 Once you figure out how to make ravioli it can be a lot of fun. 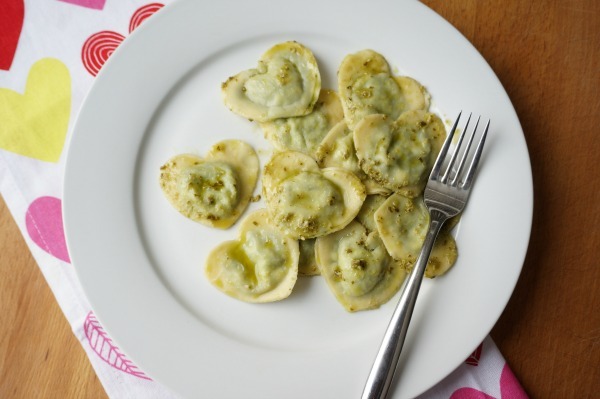 Experiment with meat fillings and even sweet ravioli. 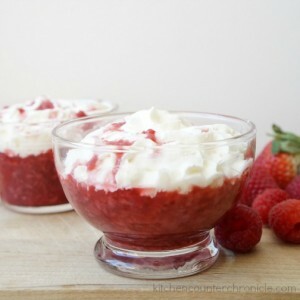 I’m thinking about trying a marscapone stuffed ravioli with a maple syrup and strawberry sauce…breakfast pasta! What is your favourite ravioli filling? Wow.. had no idea they would be so easy! I love ravioli. 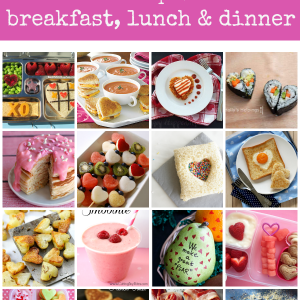 Making it heart-shaped for Valentine’s Day is a great idea! Looks delicious! This would be a perfect Valentine’s dinner!